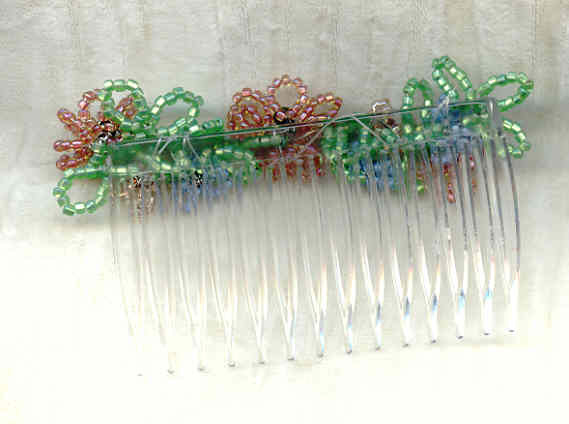 This pretty hair ornament is a 3" wide clear plastic comb embellished pink, cornflower and coral seed bead flowers and leaves of flowing matte spring green seed beads. 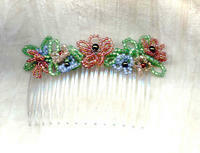 The flower's centres are tiny 3mm and 4mm burgundy and forest green glass pearls. The intricate and time-consuming double-needle work necessary to make the design has been worked in 34-guage (super fine) wire; and it has been secured to the comb with clear monofilament. In addition, the design is bonded to the comb. 'Overkill,' you say? 'A belt and suspenders,' you say? Nothing's too good for OUR customers, and we aim to have that design stay put! This piece of durable loveliness is brought to you courtesy of SPARKLE PLENTY.